This year’s Student Lecture Series focuses on practices built in reaction to architectural shifts in history. Professor Beatriz Colomina's work questions the relationship between architecture and media. 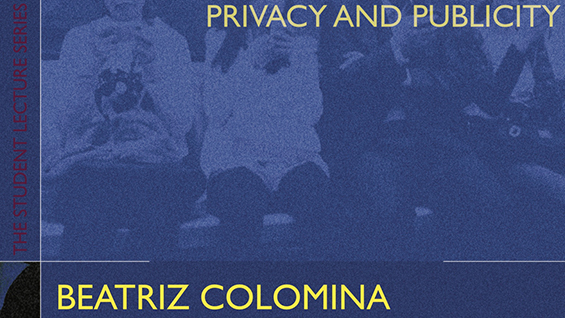 Professor Colomina is the Founding Director of the graduate Program in Media and Modernity at Princeton University, where she has taught since 1988. Among her numerous successful publications such as “Cold war hot Houses”, “Double Exposure: Architecture through Art”, and “Domesticity at war”. She is best known as the author of the books “Privacy and Publicity: Modern Architecture as Mass Media”, and “Sexuality and Space” which have both been awarded with the international book award by the American Institute of Architects, in 1993 and 1995. Most recently, Professor Colomina co-curated the Istanbul Biennale of Architecture with Mark Wigley.